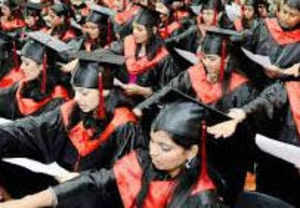 AHMEDABAD: The more educated a woman, the higher the salary discrimination she faces at work, says a recent study by a faculty member of the Indian Institute of Management, Ahmedabad (IIM-A). While women with no formal education earn more than their male counterparts, with an increase in educational qualification, the situation reverses. So women with basic education like advanced certificates or diplomas earn 10% less than equally qualified men, but the wage gap shoots up to over 40% in cases where women have master’s degrees. The main reason for this is that in India, there is a general perception that a woman’s primary responsibility is unpaid care work, like looking after children and family, and this perception channels them into similar work areas in the labour market, where they are paid handsomely for it. For instance, with no formal education, the average annual income of women surveyed is Rs 1.41 lakh while for men it is 1.26 lakh, indicating women are 11.99% ahead. However, when it’s two highly educated candidates, male and female, competing for a job, the study reveals that in most cases, employers favour men over women. “This type of discrimination is also called pre-market (past or indirect) discrimination, because it occurs before the individual seeks employment,” says the survey titled ‘Gender Pay Gap in the Formal Sector: 2006-2013’ by Professor Biju Varkkey, faculty of Personnel and Industrial Relations Area and Rupa Korde, faculty, Economics Area, Foundation for Liberal and Management Education, Pune. So women with master’s degrees earn an annual average income of Rs 2.70 lakh while men make Rs 4.56 lakh, a 40.76% jump on the former. Explaining the disparity in incomes, the study says that women either decide not to take jobs which require extensive on-the job training or exit the job early in life for various reasons (like marriage or motherhood) which lower their earnings. Women often take breaks in their careers, or opt for part-time jobs when they are required to take care of their children. When these women return to the labour market for full-time jobs they are often offered lower wages than their male counterparts. “Even those women who do not have children are not given any preference because they are categorized as potential mothers,” says the study. A report based on the survey has been prepared by Paycheck India, a research initiative of IIM-A, and supported by non-profit organization Wage Indicator Foundation and University of Amsterdam. The all-India survey is based on 21,552 respondents over a period of 7.5 years.